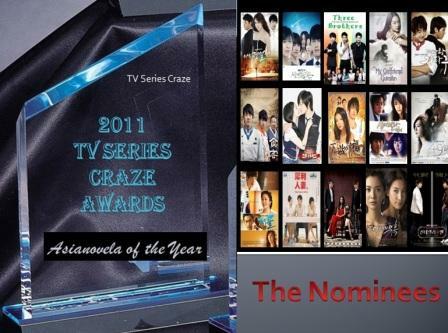 The 2011 TV Series Craze Awards: "Asianovela of the Year" Nominees! Different Asian TV series dubbed in our very own Filipino language were still huge hit this year. The three rival giant TV stations offer us different Asian drama which becomes the household favorite. Either Koreanovela or Chinovela, they were still well-accepted in the Filipino taste! Since Asianovelas were still in-demand, the 2011 TV Series Craze Awards opened a new category. And this is the "Asinovela of the Year" category! 17 Asinovelas made it to our list! These were the Asian TV series who conquered our TV for this year. But still the question goes, which is the best among the rest?! The answer depends on your vote! Again, there are two ways to cast your votes. First is through this website by voting in our voting area located in the right side panel. The second one is through our official Facebook Fan Page. To vote in our Facebook Fan Page, like first the fan page if you're not yet a fan. Then locate the album of the nominees. Click "LIKE" to the corresponding poster of your choice! Here is the link of the said album where you can cast your votes: VOTE HERE.